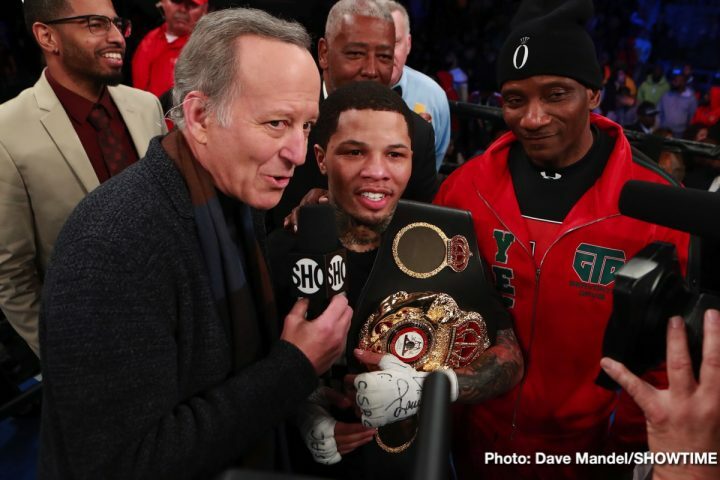 By Sean Jones: Gervonta ‘Tank’ Davis (21-0, 20 KOs) will be back inside the ring for his next Professional bout in May after a potential April exhibition match in Japan against kickboxer Tenshin Nasukawa, according to his promoter Floyd Mayweather Jr. The U.S boxing fans are more interested in who Tank Davis, 24, fights next for his May fight than they are in his potentially exhibition match in April. If the Nasukawa fight happens, that event would clearly be more of a business type of affair for Davis than one that would increase his popularity in the States. An exhibition match against Tenshin might actually hurt Davis’ popularity, because it’ll give an appearance that he’s focusing on weak opposition and not talented fighters. The fans want to see Davis fight Vasyl Lomachenko. Facing Tenshin will make some of fans think Tank Davis is ducking Lomahenko. It’s a win-win for Lomachenko if Mayweather starts taking Gervonta Davis all round the world to face non-boxers from the MMA world left and right. Some feel that Mayweather, 42, doesn’t have any choice to fight those type of guys due to his age. If Mayweather were to take on a top welterweight like Errol Spence, he’d likely be run out of the ring and embarrassed. But for Mayweather to have Gervonta following in his footsteps in facing MMA guys too, it looks like he’s wasting the young fighter’s career, and potentially hurting his reputation. After Gervonta’s first round knockout win over Hugo Ruiz (39-5, 33 KOs) last Saturday night in Carson, California, it’s important that he face someone good, and not another weak opponent that doesn’t belong inside the same ring with him. Tenshin would a big step down from Ruiz. The April exhibition won’t be an official fight. It’s a way for Davis, 24, to make some good money fighting the popular Japanese fighter Nasukawa, who Mayweather knocked out in the 1st round in an earlier three round exhibition on December 31 at the Saitama Prefecture Super Arena in Saitama, Japan. Mayweather had a big size advantage over the 126 lb Nasukawa, and he knocked him down several times before the fight was stopped in round one. “I’m down to anything that makes sense,” Mayweather Promotions CEO Leonard Ellerbe said in talking about Gervonta Davis’ future fights last Saturday night. “We’re going to do things on our time table, and the way we want to do. Gervonta Davis is going to make big noise fighting anybody. I’m not going to talk about any of that stuff. We’re going to put our heads together. This guy [Gervonta Davis] is special. It’s not about who he’s fighting. I’m very confident about whoever I put in front of him, he’s going to be able to display every bit of his arsenal. He’s an entertainer. He’s got tremendous defense, and he’s a very very skilled boxer,” Ellerbe said. Davis defeated replacement opponent Hugo Ruiz last Saturday night by an impressive knockout in round one at the Dignity Health Sports Park in Carson, California. Davis was going to fight Abner Mares, but he was injured. Davis vs. Mares at least was an interesting fight in the eyes of some boxing fans, even though Abner had lost his last match to Santa Cruz. “It’ll be soon. It’ll be a quick turnaround,” Ellerbe said about Davis. “I don’t want to compare them [Floyd Mayweather Jr. and Gervonta]. Tank is going to be the biggest star in the sport. He’ll be a household name no different than Mayweather. He’s a little guy that possesses a big punch. We’re going to keep him very busy. We’re going to put people in front of him, and he’s going to knock them out. He’s going to be the biggest star in the sport,” Ellerbe said. Davis said he wants to fight 3 to 4 times in 2019. That’s obviously hard to believe. However, it’s unclear whether the exhibition match between Davis and Tenshin will count as one of his fights? It wouldn’t be surprising if that’s the case. Davis won’t gain any experience beating up on a fighter who doesn’t have a background in boxing like Tenshin. It wouldn’t be a good idea for Davis’ fight with Tenshin to be televised in the U.S, as the fans will be repulsed at seeing such a poor match-up on the back of last Saturday’s mismatch between Gervonta and Ruiz. There’s still no date for the Davis vs. Tenshin fight. Mayweather didn’t discuss that part, but he does seem confident that the fight between those two will take place. Having Gervonta fight in Japan might increase his popularity in that country. However, that won’t help Davis become a PPV star in the United States, which is where he’ll make his money if he can take his career to that level. It’s hard to imagine a foreign fighting league or promoter wanting to pay Gervonta Davis huge money for an exhibition match unless Mayweather was part of the deal. Davis isn’t even a star in his own country of the U.S. Why would someone want to pay him big money to fight exhibitions? That doesn’t make sense. Gervonta’s biggest career win thus far was arguably against Jose Pedraza. Beating him isn’t a big deal. Now if Davis had been beating the likes of Lomachenko, Santa Cruz, Oscar Valdez, Russell Jr., Berchelt, Cancio, Warrington and Mikey Garcia, then it would make sense for someone to want to offer him huge money to fight in exhibition matches in Japan against Tenshin. Right now, it’s hard to imagine someone wanting to pay Gervonta to fight Tenshin. The guy that they should be trying to get to face Tenshin is Lomachenko. He’s clearly ahead of Davis right now in terms of accomplishments as a pro. The fans would be interested in who Davis’ “real fight” will be against. It’s a bad sign that Ellerbe and Tank are both talking about wanting to reschedule against Abner Mares. It would be a better deal for boxing fans to at least see Davis fight someone like IBF champion Tevin Farmer or newly crowned World Boxing Association ‘regular’ super featherweight champion Andrew Cancio. Those guys are at least champions, and they fight in the same weight class as Davis. They’re not old at 33, coming off an eye injury and a loss before that against Leo Santa Cruz. Mares would have been a good option for Davis to fight if it took place three to five years ago before Mares’ two defeats to Santa Cruz. As for Mayweather, he made it clear that he’s going to continue to fight exhibition matches in the future, and he says he can make $80 million with them. It’s a good thing that Mayweather isn’t saying that these would be fights that counted as part of his professional record, because it was very strange how the Nevada State Athletic Commission sanctioned his fight against UFC fighter Conor McGregor as a professional boxing match in 2017. McGregor had never fought in a professional fight before, and he didn’t have an amatur background in boxing. In other words, McGregor was no different from any athlete from a different sport. It could have been wrestling or golf, and it would have looked just as odd for the fight to be sanctioned as a professional match. At his age, it’s good that Mayweather can make that kind of money fighting guy with no background in boxing, but for him to have Gervonta potentially doing the same thing. It’s such a waste, and it’s hard to imagine anyone wanting to pay to see those kinds of fights. Davis isn’t a star yet, so why would anyone from outside of the U.S want to pay him big money to fight a non-boxer in an exhibition match?